Onions as a side dish? Yes, oh yes! Vidalia onions are in season AND on sale so I thought I’d give Paula Deen’s Saturday Night Vidalia Onions recipe a whirl. I “tweaked” the recipe just a bit by adding cheese and substituting low-sodium bouillon for regular bouillon. (Regular bouillon can be a little salty.) I also added more information to the oven baking directions. Directions for charcoal grill: Prepare a fire in a charcoal grill. Directions for oven: Preheat oven to 400 degrees F.
Slice the stem end from the top of each onion. Peel the onions leaving the root end intact. Using a potato peeler, cut a small, cone-shaped section from the center of the onions. Cut the onions into quarters from the top down, stopping within 1/2-inch of the root end. Gently spread the onion layers just a bit with your fingers making it easier to slip the butter in. 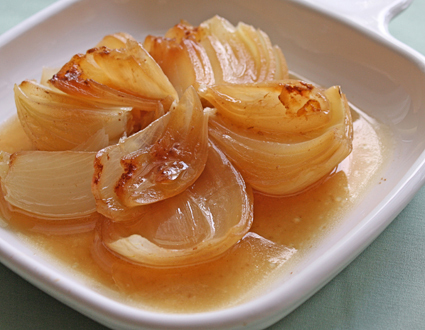 Put slivers of butter between the onion sections, place one bouillon cube (or 1 tsp. beef granules) in the center of each onion, and sprinkle with pepper. Wrap each onion securely in heavy duty foil. For the grill, place the onions directly onto the hot coals. Cook for 45 minutes turning every so often. For oven baking, place the foil-wrapped onions in a shallow baking pan. Bake for 1 hour and 15 minutes. Check for softness with a knife. If adding cheese, open foil slightly and add one tablespoon cheese per onion. Close the foil and wait two minutes to give the cheese time to melt. Delicious served with a Ribeye or BBQ chicken. Variation: Use chicken bouillon to change things up a bit. My husband would LOVE this... Thanks for sharing! Oh I'd love these! Onions are one of my favorite veggies ever! @Maureen- You can use any onion that's on the sweeter side. Thanks Harried Cook and Marnely! Restaurant Supply Stores- Worth a visit!